Spellbinding, moving--evoking a fascinating region on the other side of the world--this suspenseful and haunting story announces the debut of a profoundly gifted writer. One August afternoon, on the shoreline of the Kamchatka peninsula at the northeastern edge of Russia, two girls--sisters, eight and eleven--go missing. In the ensuing weeks, then months, the police investigation turns up nothing. Echoes of the disappearance reverberate across a tightly woven community, with the fear and loss felt most deeply among its women. Taking us through a year in Kamchatka, Disappearing Earth enters with astonishing emotional acuity the worlds of a cast of richly drawn characters, all connected by the crime: a witness, a neighbor, a detective, a mother. We are transported to vistas of rugged beauty--densely wooded forests, open expanses of tundra, soaring volcanoes, and the glassy seas that border Japan and Alaska--and into a region as complex as it is alluring, where social and ethnic tensions have long simmered, and where outsiders are often the first to be accused. In a story as propulsive as it is emotionally engaging, and through a young writer's virtuosic feat of empathy and imagination, this powerful novel brings us to a new understanding of the intricate bonds of family and community, in a Russia unlike any we have seen before. 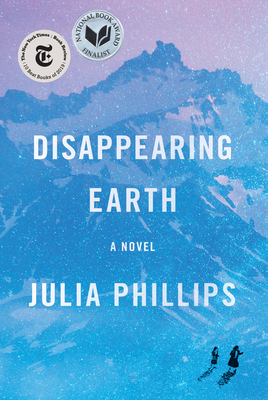 JULIA PHILLIPS is a Fulbright fellow whose writing has appeared in Glimmer Train, The Atlantic, Slate, and The Moscow Times. She lives in Brooklyn. "A genuine masterpiece, but one that is easily consumed in a feverish stay-up-all-night bout of reading pleasure. It's as much a portrait of humanity as of a small Kamchatka community."